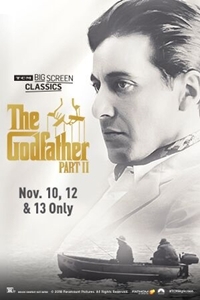 Fathom Events, TCM and Paramount Pictures present The Godfather Part II, returning to cinemas for a special three-day event! Francis Ford Coppola continues his epic Godfather trilogy with this saga of two generations of power within the Corleone family. Coppola, working once again with the author Mario Puzo, crafts two interwoven stories that work as both prequel and sequel to the original. One shows the humble Sicilian beginnings and New York rise of a young Don Vito. The other shows the ascent of Michael as the new Don. A timeless classic best revered on the big screen, time tested fans and newcomers alike won't want to miss this special event featuring exclusive insight from Turner Classic Movies.